Impressions from Malta during a visit with a group of disciples in early 2016. Besides our regular meditations and inspirational programs I had time to capture some glimpses of the island that I am presenting here in form of a slideshow combined with music by Parichayaka Hammerl. Enjoy! During my recent stay in Malta, I enjoyed to be at the seashore and captured some moments in this video clip. Meditate with Mother Nature for 9 1/2 minutes; the soundtrack is by Parichayaka Hammerl. Filmed and edited by Kedar Misani. On March 19, 2016 the 33rd statue of Sri Chinmoy has been inaugurated in a peace parc in Cesano Boscone, Italy. More (in Italian) on : mi-lorenteggio.com. These posters for a meditation class by students of Sri Chinmoy have been discovered at Danquah Circle, Accra, Ghana by photographer Daniel Kerkhoff, who knows Sri Chinmoy from the time he lived in Jamaica, Queens. On March 12th 2016 the 32dn life-size statue of Sri Chinmoy has been inaugurated in the National Botanic Garden of Wales, also visited by the Peace Run the same day. When Vladimir Petrovsky passed away in 2014, many felt that a rare personality had left this earth – somebody with a unique combination of an academic background, a practical approach, a humanistic view, a visionary spirit, a positive and optimistic outlook and a deep longing to bring the human family closer together. 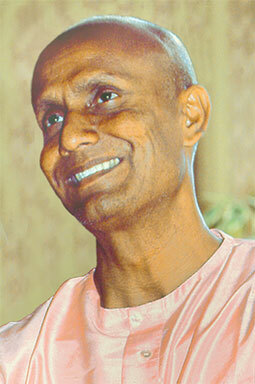 Having worked closely with him for a number of years, author Shashanka M. Karlen felt that his life and work, his vision and personality, his achievements and recommendations could serve as an inspiration to current and future generations and contribute to a world of peaceful coexistence, trust, solidarity and cooperation. As much as the book is intended for the future, it also offers ample insights into the history of the last fifty years and the huge transformations of political, diplomatic and even personal landscapes that have taken place in this time. The forweword has been written by President Mikhail Gorbachev. Many thanks to author S.M. Karlen, who gave us the permission to quote the above texts from his new book “Vladimir Petrovsky – The Master Diplomat”, published 2015 by The United Nations SRC Society of Writers, ISBN: 978-1-938599-80-4. master-diplomat.com. Members of the international Sri Chinmoy Centres arranged and performed music by Sri Chinmoy (1931-2007) in the Teatru Salesjan in Sliema, Malta, in January 2016. Watch some excerpts of this concert. More on this ongoing series of “Songs of the Soul” concerts you can find here: songsofthesoul.com. Video by Kedar Misani, kedarvideo Switzerland. Dr. Davidson L. Hepburn of the Bahamas is a distinguished member of the international community, well known at New York UN Headquarters as Ambassador to the Bahamas for 10 years as well as in Paris at the headquarters of UN Educational, Scientific and Cultural Organization (UNESCO), one of the lead agencies mandated to promote a Culture of Peace. We could interview him in Malta in January 2016 where he attended several peace activities of the Sri Chinmoy Centres including the inauguration of a life-size statue of Sri Chinmoy in Sliema. Produced 2016 by kedarvideo. This is the 38th episode of the series LIFE Voices, presenting inspiring people from around the world.